When you’re a major distribution company for meat processing equipment around the world, you need a no-nonsense approach to your digital presence. Visual Compass was able to deliver a clean, custom-designed website for AmTrade Systems. Our new homepage design showcases all four equipment manufacturer partners, and leads the user to the equipment models and the vast products that can be made with each particular equipment. This web project included an accompanying touch screen television for utilization at AmTrade’s many successful trade shows and expos. 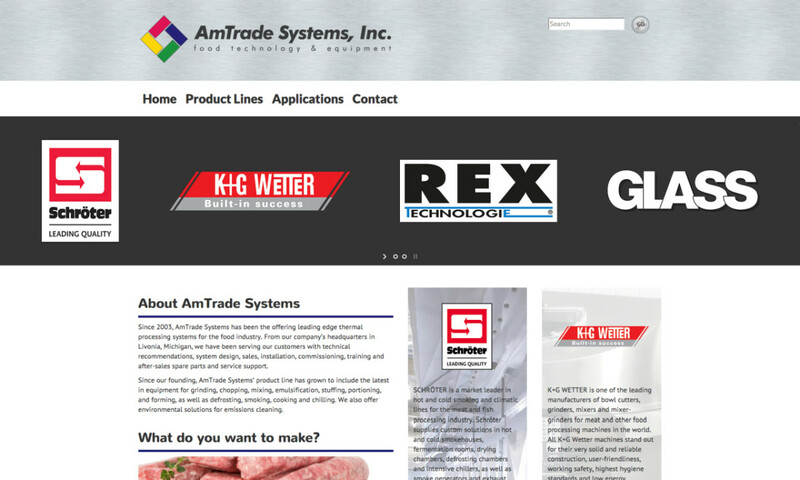 Keys to Success: custom website design with particular consideration to conveying a strong brand for AmTrade Systems, but also featuring their four brand partners and their equipment. We also completed a refreshed logo design, maintaining their established brand, but offering an updated aesthetic.